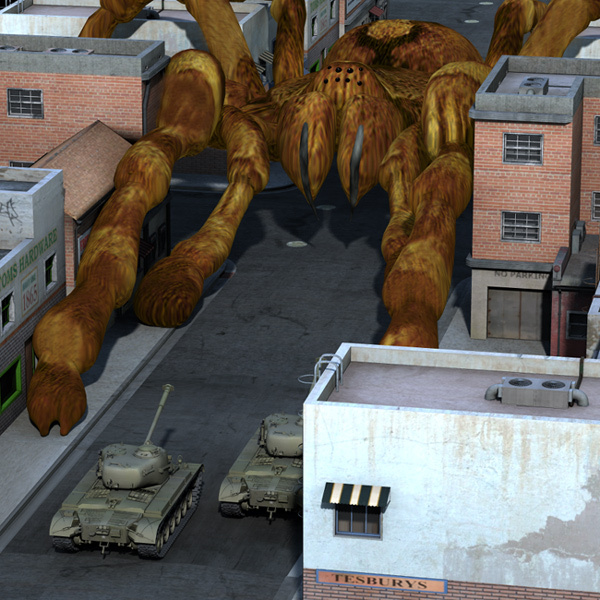 This image depicts one of the key scenes from the 1953 cult classic, "Attack of the Giant Spiders from Mars". 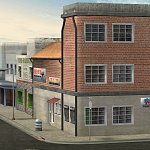 In this scene, the spiders have made their way into a quaint village (since the producers of the movie couldn`t afford to film in a big city) as the Army makes a last-stand effort to stop the spiders. As many film historians have pointed out, the title of the movie is somewhat misleading: the giant spiders were actually created from an atomic blast on Earth, which enlarged them. Though the atomic blast was caused by Martians. -4 copies of the Urban Buildings (buidings #1-#4) and 4 copies of the Urban Building ground, by EdW and mrsparky. 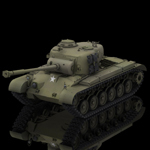 -2 copies of the Pershing M26 Tank, by DeEspona and ranman38. 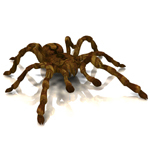 -1 copy of the Tarantula, by DeEspona and DAD.